Place all the tomato chutney ingredients into a pot, then simmer gently until thick and a jam-like consistency. Gently mix together salmon, crème fraiche, shallot, chives, lime juice and zest. Arrange on a plate, then top with coriander cress and a drizzle of olive oil. 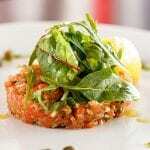 Serve the salmon tartar with the tomato chutney.